For the fifth year, Dolphin Blue made B Lab's “Best For Environment” list. Photo courtesy of Dolphin Blue. Dallas-based Dolphin Blue was recently recognized for its positive environmental impact based on an independent assessment administered by the nonprofit B Lab. Dolphin Blue is a certified B Corporation founded in 1994 by Dallas environmentalist Tom Kemper. The online store has been selling eco-friendly office supplies, home and garden items, personal care products, pets supplies and children’s toys for more than two decades. For the fifth consecutive year, Dolphin Blue made the “Best For Environment” list, which includes businesses that earned an environment score in the top 10 percent of more than 2,400 Certified B Corporations on the B Impact Assessment. 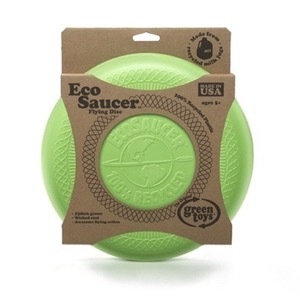 The EcoSaucer Flying Disc is one of the many eco-friendly products available on DolphinBlue.com. It is made in the U.S.A. from 100 percent recycled plastic grocery bags. To certify as B Corporations, companies like Dolphin Blue must complete the full assessment and have their answers verified by B Lab. The environment portion of the B Impact Assessment evaluates a company’s environmental performance through its facilities, materials, emissions, and resource and energy use. Companies answer questions about their transportation/distribution channels and the environmental impact of their supply chain. More than 220 Best For Environment companies come from 72 different industries and 25 countries and include honorees: Carnegie Fabrics; People Against Dirty/Method; Rubicon Global; and Seventh Generation. “With the rise of anger at a system that feels rigged, people are hungry for companies like Dolphin Blue, who are changing the system by building businesses that seek to create the greatest positive impact,” says Jay Coen Gilbert, co-founder of B Lab. GreenSourceDFW.org is an online publication covering environmental news in North Texas.